About company set up in 1992, our company offers factory outlet service and has oversea location in California. Any requests will be answered within 24 hours. About product safety Epicord outdoor extension cord consists of three conductors and a three-prong plug, grounded for safety. The extension cord selects high quality wire rod, the surface is light, soft and easy to receive. It is made of high quality PVC material, wear resistance material and good flame retardant performance so that it is safe to use. 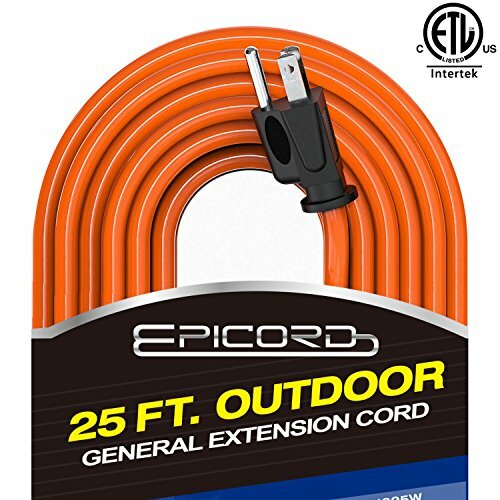 Applicable site Epicord outdoor extension cord is the best choice for you to keep one in: car, garage, office, kitchen, outdoor... warning outdoor extension cords can be hazardous. Misuse can result in fire or death by electrical shock. Please read both sides carefully and follow All directions. Before use 1.Inspect thoroughly before each use, do not use if damaged 2.Look for the number of watts on appliance to be plugged into cord 3.See label on cord for specific Wattage 4.Do not plug more than the specified number of watts into this cord 5.Do not run through doorways, holes in ceiling, walls or floor 6.Make sure appliance is off before connecting cord to outlet 7.Fully insert plug into outlet 8.Do not remove, bend or modify any metal prongs or pins of cord 9.Do not use excessive force to make connections during use 1.Keep away from water 2.Keep children and pets away from cord 3.Do not plug one extension cord into another 4.Do not drive, drag or place objects over cord 5.Do not walk on cord after use 1.Grasp plug to remove from outlet 2.Always store cord indoors 3.Always unplug when not in use 4.Do not unplug by pulling on cord.